Front running Dreams Aplenty scored a win for the locals by leading all of the way in the Listed $100,000 XXXX Gold Coast Cup (1400m) at the Gold Coast today. Dreams Aplenty, above, was the winner of the Golf Coast Cup at the Gold Coast. Photo by Ultimate Racing Photos. Tegan Harrison took Dreams Aplenty straight to the front and was able to fight off all the challengers in the run to the line. Dreams Aplenty was one of the fancied runners at $5.50 in a wide betting race and had a head to head to spare on the from runner up Aqua Vite ($5) with the Tony Gollan trained Charlie Boy ($26) sneaking up along the inside fence for third. 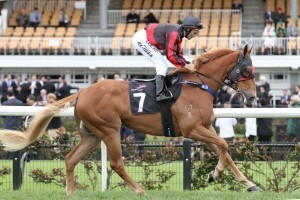 Dreams Aplenty was having his second run back from a spell following a first up third over 1400m at the Sunshine Coast three weeks ago and trainer John Zielke that it was now time to step the four year old up to 1600m. “He is going to go to the mile (1600m),” Zielke said. Zielke was full of praise for Harrison front running ride on Dreams Aplenty and said that she knows the horse very well. “He is a tough horse. He just doesn’t lay down on the canvas, he just keeps coming,” Zielke said. The $4.60 equal favourite Rhyme Nor Rhythm was prominent on the home turn and fought on to finish fourth while the other equal favourite Snippets Land wound up in seventh spot.